In the latest in our series about London districts, we’re going to a look at the Borough of Wandsworth. A predominantly residential area, this is Inner London’s biggest borough and it is located on the south bank of the River Thames. Here are ten of the best and worst things about living in Wandsworth. 1. Parks and green spaces. If you are looking for somewhere that has lots of green spaces then Wandsworth should be top of your list. With dozens of parks including Clapham and Wandsworth commons and Battersea Park, you’ll never be short of outdoor space to play, exercise or simply relax. 2. The Thames. 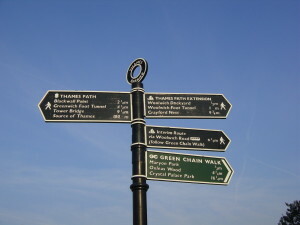 The Thames Path follows most of the riverside through Wandsworth from Battersea to Putney, offering a lovely traffic free route with stunning views across the river. 3. Happy residents. A survey by Lloyds TSB in 2013 showed that Wandsworth was the favourite place in England and Wales for aspiring young professionals to set up home. A further survey that year by PWC and Demos showed that Wandsworth was the highest scoring London borough in a study of well-being and economic success. All in all, the residents of Wandsworth are a happy bunch. 4. Transport. Wandsworth offers a range of public transport options into the centre of London. There are numerous mainline rail stations in the district and underground stations at Balham and Tooting Bec. Many bus routes also run through the area so no matter what your destination within London, there will be a public transport option to suit you. 5. Schools. If you have a family or are planning one, then Wandsworth offers a range of excellent state primary and secondary schools, many of which are rated as ‘outstanding’ by OFSTED, with many more producing above average results from the students. There are also a number of private schools in the district for those who wish to go down that route. 6. Tooting Bec Lido. This is the largest freshwater open-air pool in Europe and the only place to go on a hot summer’s day to cool off. It’s open to the public from May to September, and to members of the South London Swimming Club the rest of the year. 7. Variety of property. No matter what type of property you are looking for, you should be able to find it in Wandsworth. From large detached properties with gardens and private parking to a small one bed new-build flat, almost all types of property can be found in the district, meaning no matter what you are looking for, you should be able to find it here. 8. Property prices. Unfortunately, this is one of the less positive aspects of Wandsworth. Being so close to central London means that the property prices and rental costs in the area are relatively high, making it out with the reach of many. However, the high cost of property is slightly offset by the fact that Wandsworth has consistently set the lowest council tax rates in the country. 9. Famous residents. Depending on your personal views, these names may make the area more or less attractive! Some of the better known residents of the Wandsworth area include chef Gordon Ramsay, Take That member Mark Owen and broadcasters Fiona Phillips and Johnny Vaughn. 10. Regeneration. Wandsworth was historically am industrial location, especially along the river and this is reflected by the old and derelict buildings that can still be found in the area. Over the last 10 or so years, the area has begun to be developed, with new properties being built on old industrial sites. However, there are still areas within the borough that would benefit from further redevelopment and regeneration.